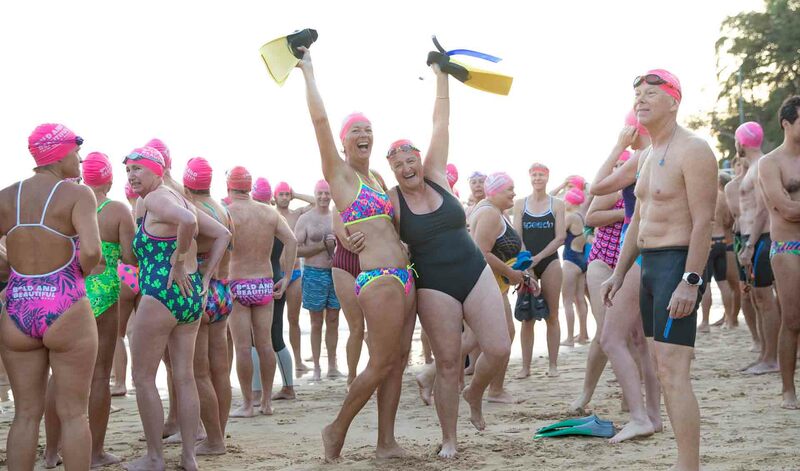 Every morning, the stretch of water from Manly to Shelly Beach is dotted with hundreds of hot pink swimming caps. Meet the Bold & Beautiful swim squad. 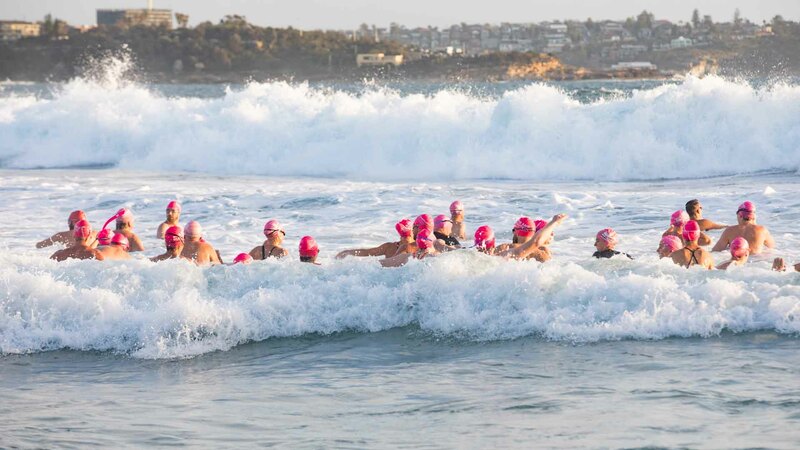 Bold & Beautiful is an open group that meets seven days a week at Manly Beach for a refreshing ocean swim. Founder Julie Isbill tells us about the thrill of the open water, and the joy of a welcoming, supportive community. It started quite accidentally when I offered to take a friend for a swim on Boxing Day, 2008. We committed to meet the following morning at 7 am. There were five of us that first morning, as my friend had done some ringing around to rally the troops for moral support. Since that day, in nearly nine and a half years, over 16,000 swimmers have swum with B&B. It's common these days to see around 300 people swimming on any given morning come rain, hail or shine. 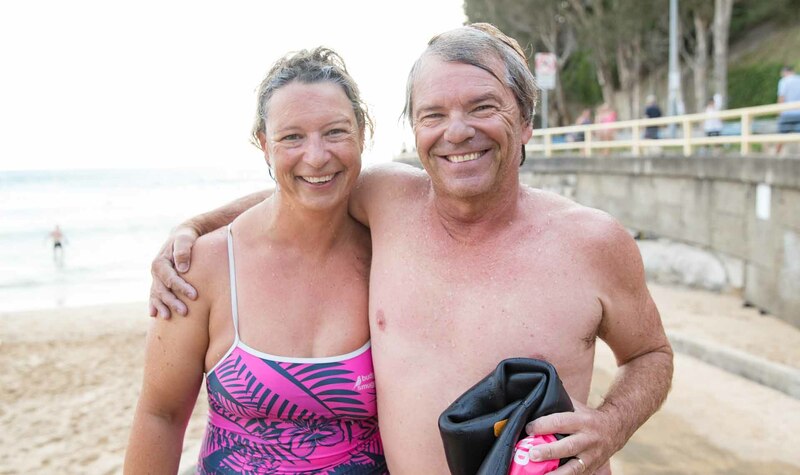 Collectively B&B has never missed a morning swim since the day we started, thanks to a wonderful team of volunteers who work hard to keep the group running smoothly for everyone, 365 days a year. It is a very eclectic group. The group spans from six-year-old children who swim with their parents, to three generations swimming with us. From job seekers to retirees, we cover the whole gamut of professionals including thespians and politicians. Not that you would know, as one of the most beautiful, levelling things about B&B is that everyone is equal in a pair of bathers, and most of the time, no one even knows what each swimmer does for a living. The group atmosphere is truly special and totally inclusive. Some people travel for an hour or more to swim before work or on the weekend. People quite literally travel from overseas and include Manly on their itinerary just to have a swim with B&B, and many send messages saying they felt so welcome. The sense of camaraderie is palpable and infectious. What do you love about swimming in the ocean? What I love about ocean swimming is being in another world. It is so amazing to feel totally free. On a calm, clear day swimming in the ocean can be like flying over the desert, but surrounded by amazing marine creatures from bait fish, to turtles, seals, sharks, dolphins and whales. The marine encounters are something that money cannot buy. The day is always better if it starts with a swim! From fitness to social connection, what are some of the best things people get from being a part of the group? The three key things that I believe are important in life are having a reason to get up in the morning, exercise, and social contact. Swimming with B&B offers all of the above. A reason to get up, cardiovascular fitness with likeminded people, out in the fresh air, in the open water. The friendships that are made are lifelong and often life changing. You swim all year round – which may seem daunting to some in winter! Can you share some advice for when it's colder? Swimming in winter can actually be quite addictive – the thrill of the chill is quite a buzz. That doesn’t mean we promote people becoming hypothermic, quite the opposite. Many swimmers participate in wetsuits, some all year round. The key thing is to do whatever it takes for you to participate safely. It’s all about participation, not competition. Although many people have their first ever swim with us in the middle of winter, I would encourage people to start earlier in the season and acclimatise as the temperature gradually starts to drop. The lowest water temperature we have recorded is 14.8 degrees, but it often sits around 16 degrees in winter – quite comfortable for a 1.5 km swim for most people, especially once they get used to it. What advice would you give someone who wanted to get more active? Find something you enjoy, and find friends or likeminded people who will soon become your friends, who enjoy the same thing as you. As one of my coaches once said to me, if one of your friends is critical or negative, it’s time to turn around and surround yourself with people who encourage you and support you in your exciting adventures. Set realistic goals – you can always keep setting new ones. It’s motivating to strive towards goals and tick boxes.